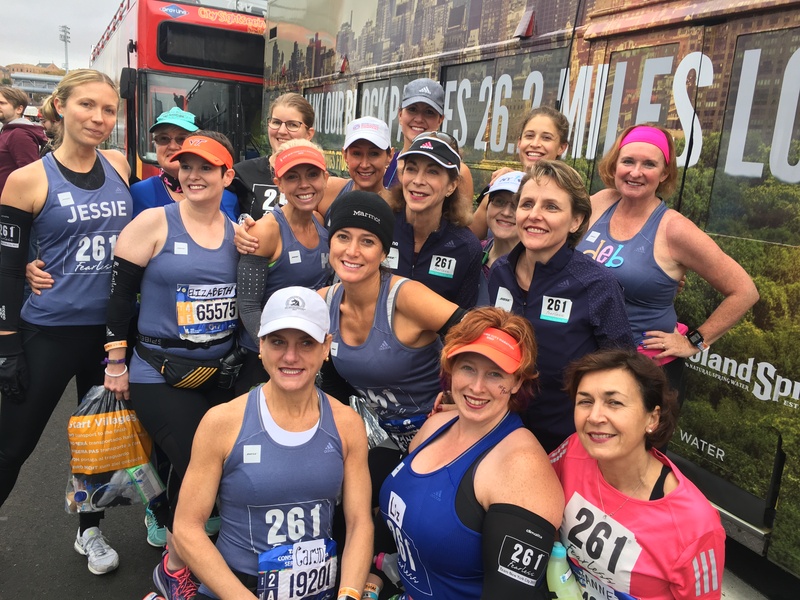 This is my team of new best friends, thanks to 261 Fearless, and their invitation to run with them at the 2017 TCS New York City Marathon. What a truly amazing experience this has been. I am so grateful for the opportunity to run with 261 Fearless for my first full marathon. These women I ran with and socialized with throughout the weekend are all phenomenal people. This is what I will hold onto the most, is this new family. And my newly discovered strength in the face of pain and adversity that comes with running a marathon. I am honoured to have been able to share this experience with one of my teammates, who also finished her first ever full marathon! We helped each other through the second half…complaining when we needed to vent, and encouraging each other to keep going, putting one foot in front of the other, and reminding each other how awesome we both are, especially in those tough moments. And I cannot forget the team members that waited to greet me in the hotel lobby as I came back, dazed and confused, and accompanied me to the after party (once I had showered). This small act of kindness was HUGE to me as well, as I wanted to celebrate, and eat, but I was also so exhausted I didn’t want to wonder around alone. What shocked me the most is the magnitude of people, both spectating and running, in the New York City marathon. The crowds were phenomenal, a little overwhelming at times, but so excited and encouraging. And how amazing is that, considering it rained all day, that people were out on the course the whole way for so many hours, cheering, both for loved ones and complete strangers. I have never heard my name called out and encouraged so much in my life. It felt amazing. The crowd really did get me through…I felt like I floated through the first half of that marathon, until I realized…I had to do it all over again, and I was already starting to feel tired. Half way was actually one of the hardest moments for me, mentally and emotionally, because that’s when the self doubt started. But it didn’t last for long, as I found my teammate, Elizabeth, and I changed up my plan and we finished together, strong. The temperature was perfect, the misty rain was constant and welcomed, and the crowd was inviting. It was truly an amazing, once in a lifetime experience for me. I hope to someday run again with 261 Fearless. But for now, I will savour the memories of New York, and my new friends.